You are currently browsing the archives for the painting category. 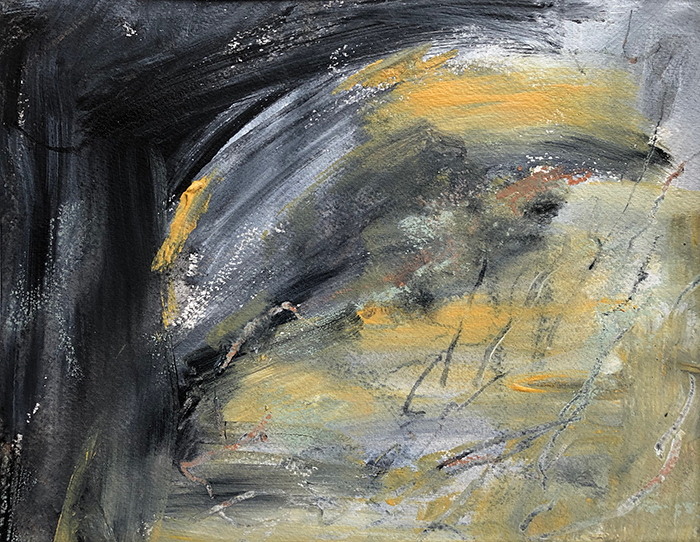 Been exploring mixed media (currently oil pastels, charcoal, ink and acrylic) on paper. Trying hard not to begin with a direction but rather prepare my state of mind by reading or a walk for example, and see where it leads me. It’s difficult for me once I see a direction not let my thinking mind take over and to become literal. 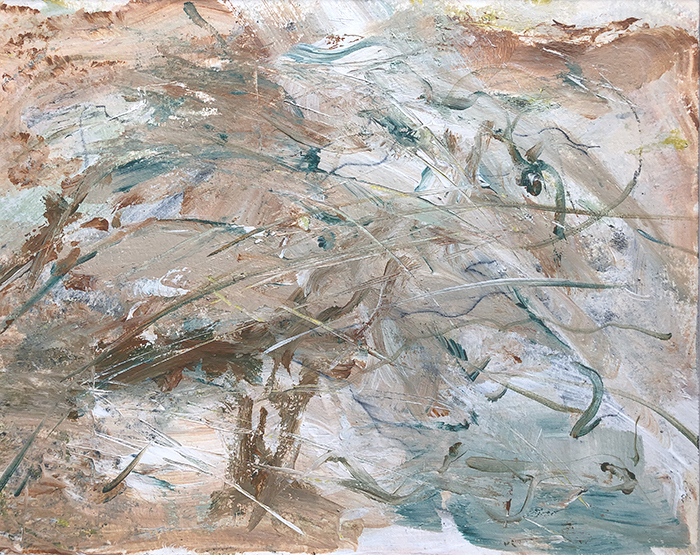 I am also trying with this work, to not dwell on the dark forces that occupy the world today as they take up too much of my life as it is but rather use these explorations to examine hope. Here are two recent results. Different days- different images. I’m interested to see how these studies affect my other work. 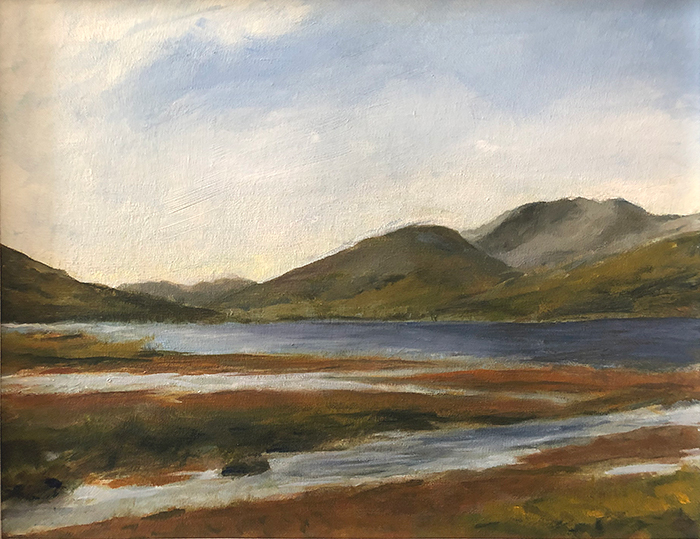 I said I’d post some of the paintings from studies I did several years ago in Ireland. Took a while but here they are. I’m still working with the idea of time and the landscape. The ancientness of this land and it’s history is overwhelming to me. Ceide Fields are bogs covering settlements over 5500 years old. I’ve done several more in this series, but this gives you an idea. Been a while. I did get back to painting. 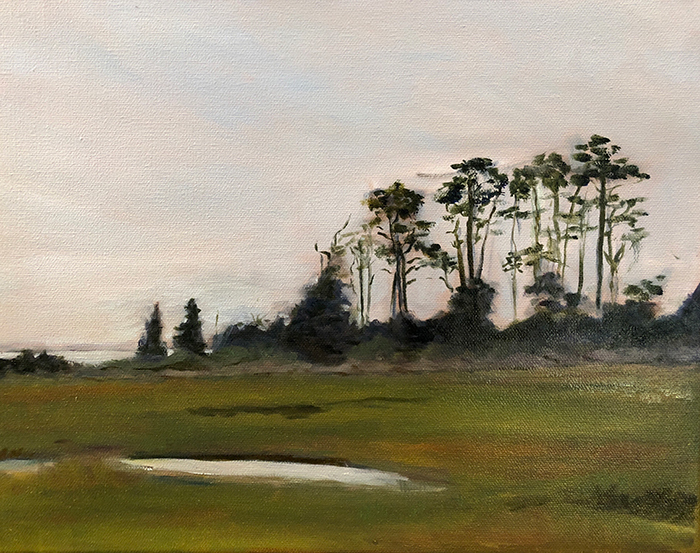 Fall has been busy and I’ve been working on landscapes. I’ve been trying to capture a sense of timelessness in my work. It’s a continuation of some of the work I did this summer with my blue images. This was the first of this session but the rest so far have been studies of images I took years ago in Ireland. I’ll post the Ireland images soon but they also contain marshland. That area between the land and the sea—so threatened right now— is magic to me. 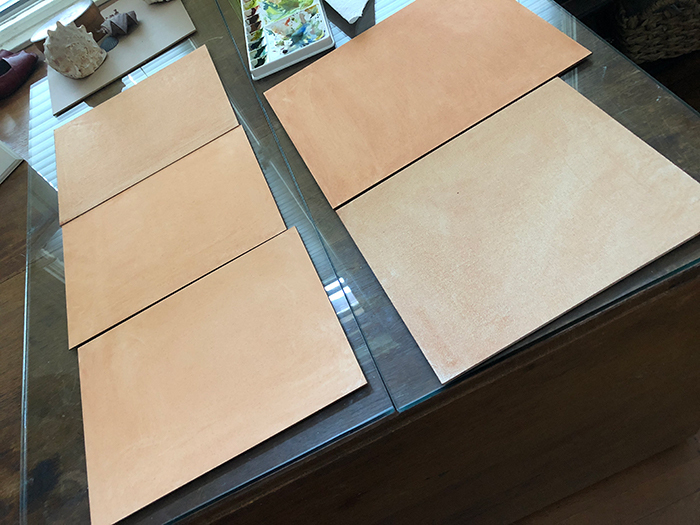 Painting Workshop – Painting Boot camp! Haven’t posted in a while – summer got pretty busy. 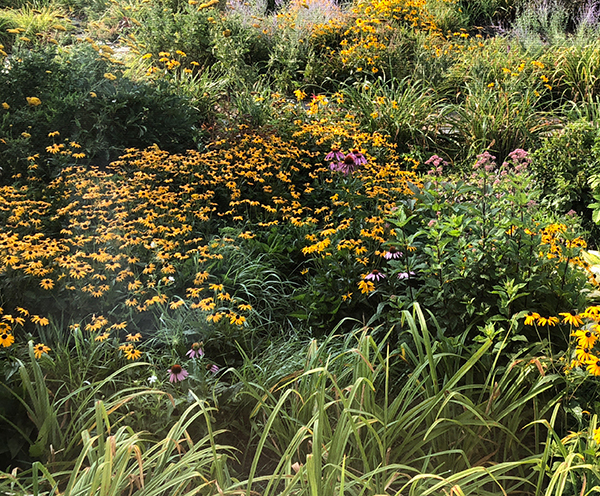 Mid August I went to VT to study with Susan Abbott. 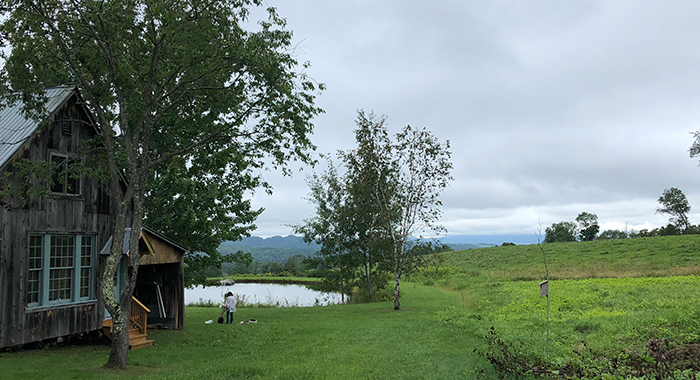 Her “Vermont Landscape Painting Retreat” was pretty much Art Boot Camp! Learned a lot, met wonderful people and was wrung out! 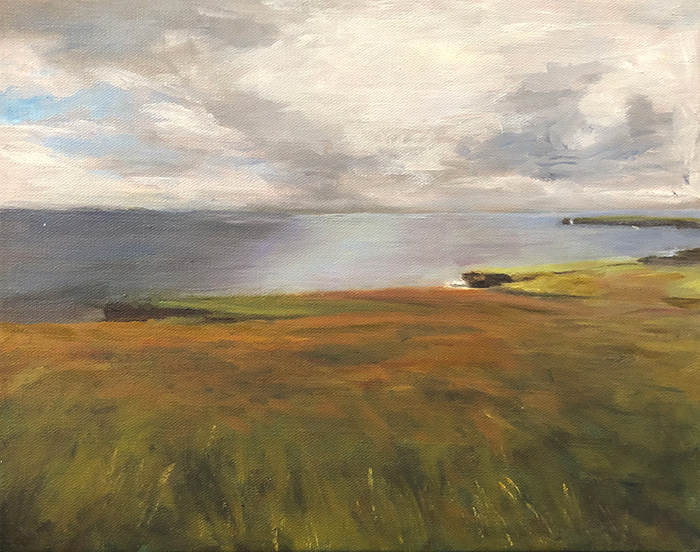 Each day consisted of lectures and demos, slides and exercises, and lots of plein air painting. Oh, and I shouldn’t forget to mention the wonderful lunches every day! Susan demonstrating in her garden. Home base was Susan’s airy studio which she had turned into a class room. 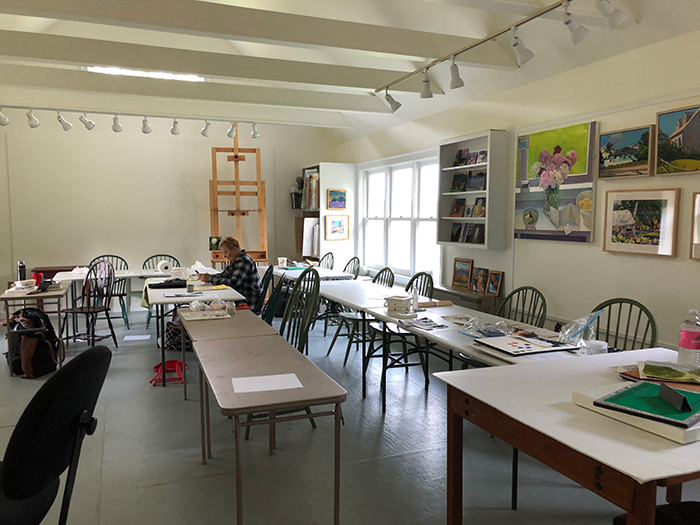 We started at 9:00 but could get there early to set up – I shot the photo below before students arrived as once we started there was no time… My work space was on the left with the red cup… Susan has a huge library of art books that were available to us. Here are shelves with her sketchbooks. 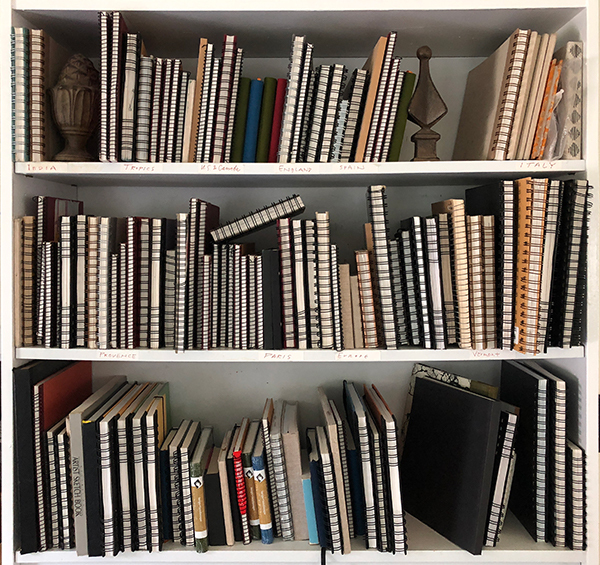 I do love to see other artist’s sketchbooks. 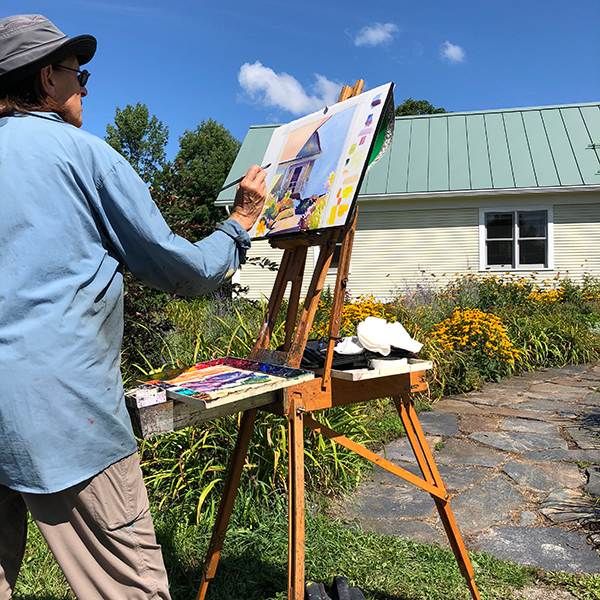 We visited gardens and farms, beautiful VT homes, meadows and mountains—each day a visual treat laid out for us to paint. 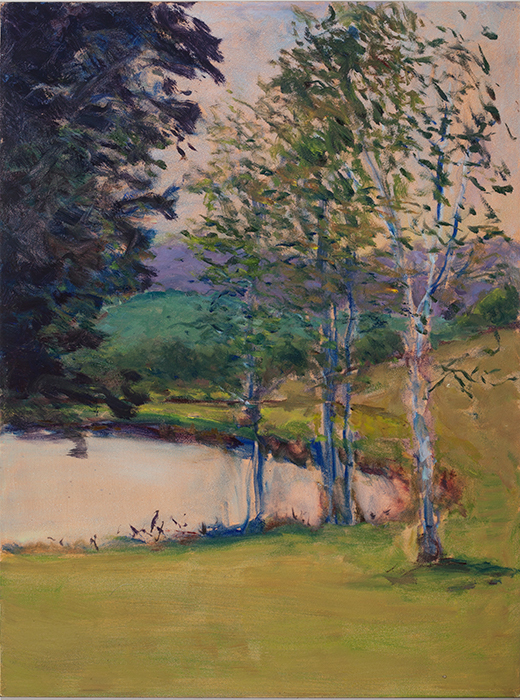 One of our plein air sites was the home, studio and pond of artist, Adelaide Tyrol. I worked with the group of trees at one end of the pond. We spent two sessions here. Adelaide’s pond and my painting. Bob came with me and after dropping me off in the mornings he went off and did train things… He’d pick me up at 5:00, we’d grab a bite to eat and I’d be back at 8:30. After a week of this we headed to Maine for a few days to unwind. That will be my next post! 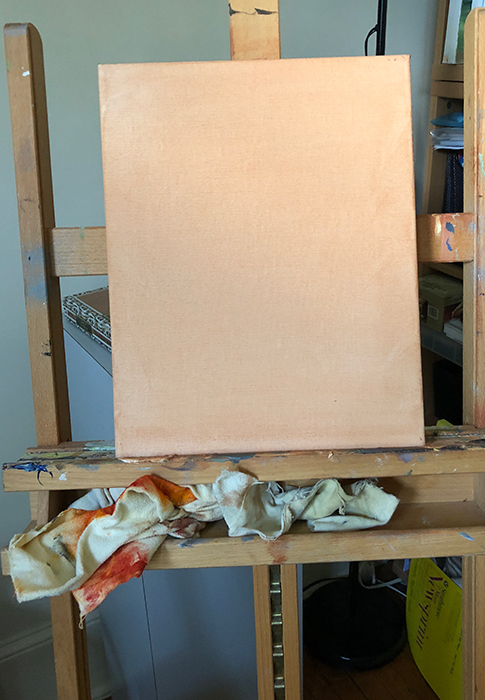 Spent part of this afternoon preparing painting surfaces for week long painting workshop I’ll be attending in August with Susan Abbott in VT. I’m excited about this work shop as I’ve wanted to study with her for a while now but the timing never worked out. 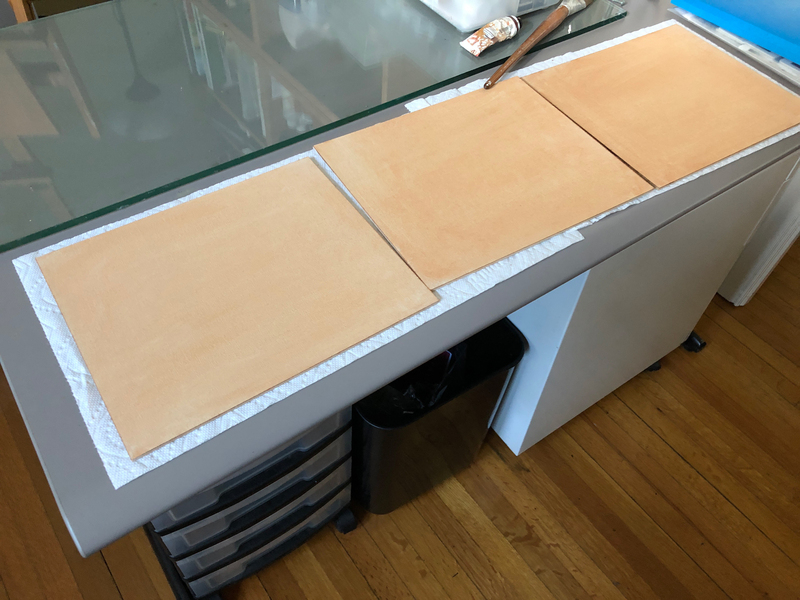 First I made sure I have wet canvas carriers for the boards and canvases I plan to take. 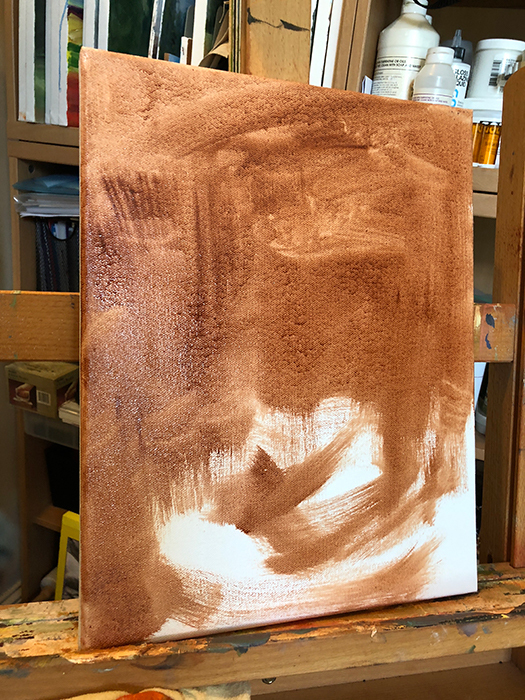 Can’t carry wet paintings home in the back of a packed car… Once that was settled, Burnt Sienna paint thinned with solvent was applied to the surface which was then rubbed with a soft rag, leaving this light toning as a starting background. Previously I’ve applied a med grey opaque layer of paint when I wanted to not start with a glaring white surface. This is Susan’s suggested method and I think I’ll like it better. This is going to be a two part project as I only have so much space to let them dry for several days and I have more to do. 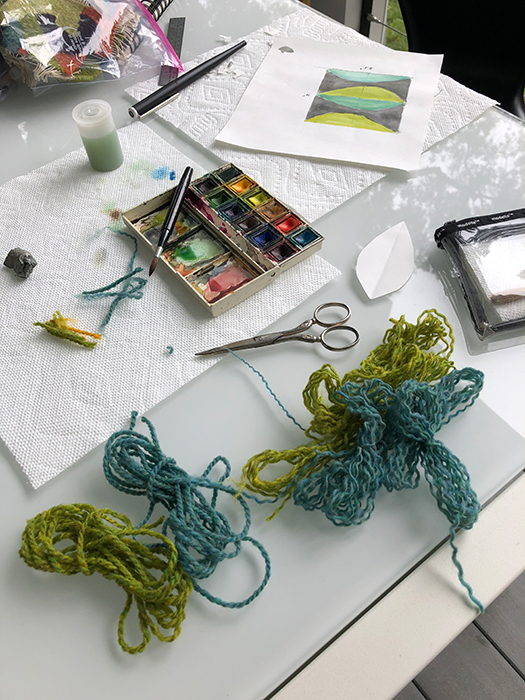 Off to Virginia to stay with Fletcher and Cooper while their parents were away and I took my Hokett Loom, yarns and design materials. 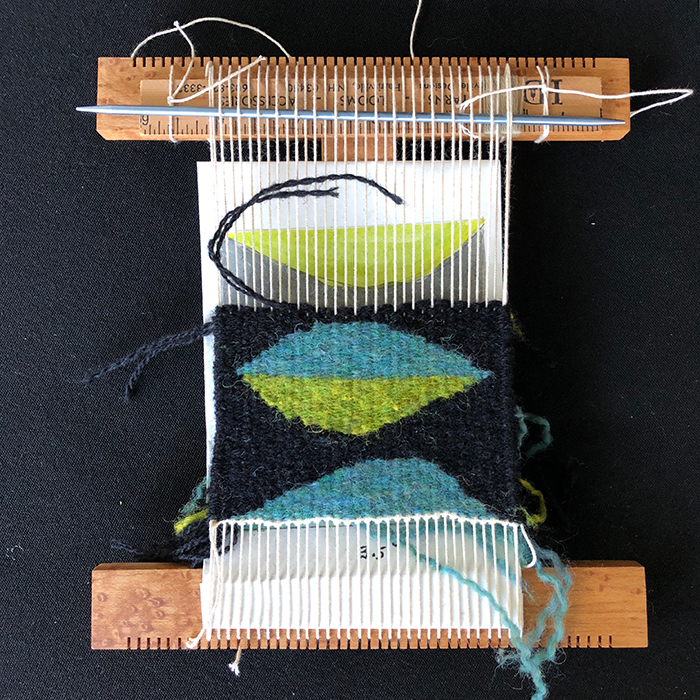 I knew the boys would have their noses in the World Cup and I would have time to indulge in weaving. 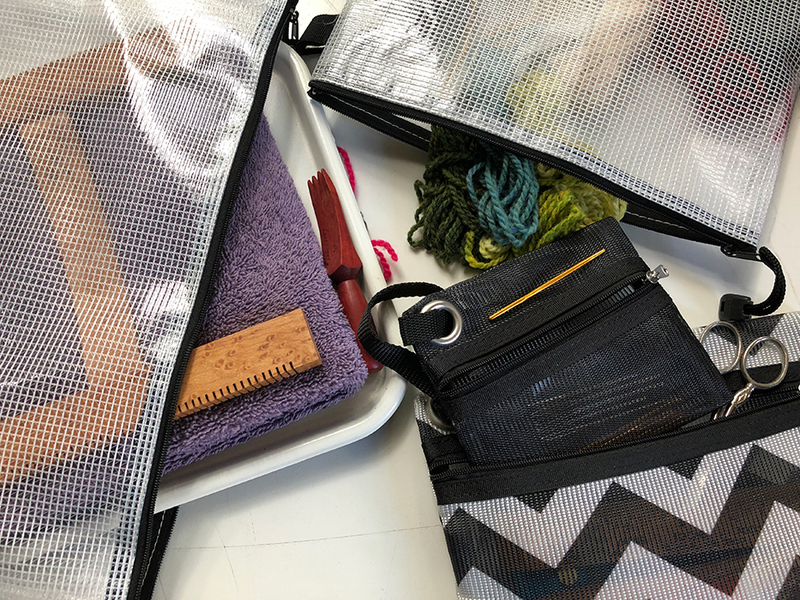 I pack my weaving supplies in translucent bags that all fit into a larger bag. One for my Hokett with the tray I use it on, one for a selection of yarns and one for little bits of equipment. My design supplies go in a small shoulder bag with watercolors, sketchbooks etc. With these two bags I could set up a little studio space and was set! Got out my sketchbook and watercolors and came up with my design. I’ve been sketching trees and leaves lately so decided on stylized leaves. Next to warp my little loom and prepare my weft yarns. I did bring the little spinner thing that I got from Rebecca Mezoff to un ply my Harrisville yarns. 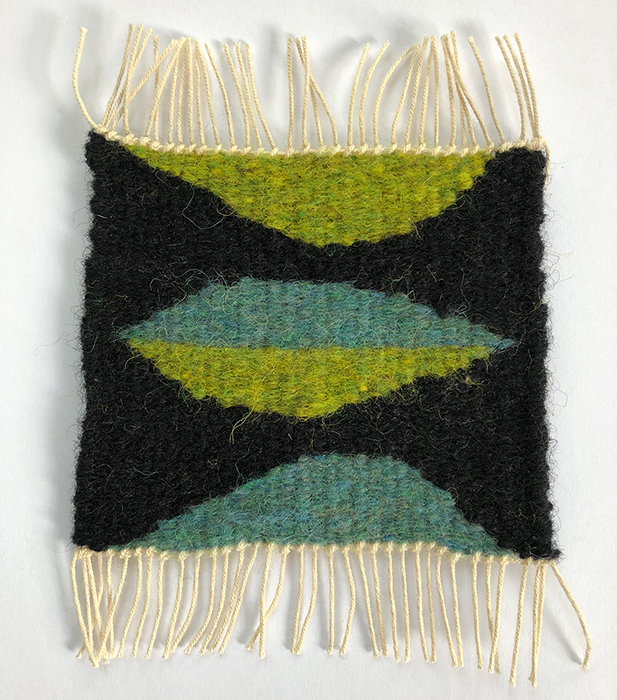 BUT… my design called for black and I forgot that while I needed to un ply the blue and green yarn, I needed to double the black and didn’t bring enough… You can see where I ran out of black yarn in the image above!!! Always something!!! !